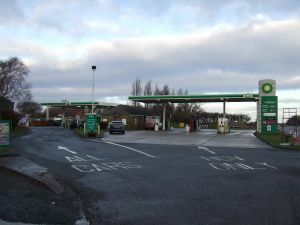 This site is better known as Exelby services, after the owners whose name was displayed prominently around the site. Overnight parking is available at £6.50 per night (northbound) or £8.50 per night (southbound), or £8.50 per night (northbound) and £9.50 per night (southbound) to include a £4 meal voucher. The southbound services in 1991. The northbound service area started with a pub called the 'Waggon & Horses Inn', next to the A19. The road became a dual carriageway in around 1970 with no convenient turn-around point. The pub was acquired by Exelby Services, who added fuel facilities in around 1977 and in 1997 built a small café. A caravan park opened up at the back of the building which closed in around 2005, causing the parking area to shrink. A southbound "service area with catering facilities" was first planned in 1975, by Exelby Services (using the modernised 'Wagon & Horses' name). 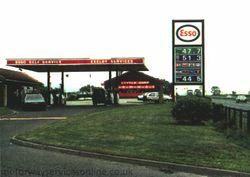 The petrol station didn't actually appear until 1985, along with a bungalow called Trenholme Lodge. The forecourt was built in the middle of the old alignment of the A19. In March 2014, the filling stations changed from BP to Shell. They were originally branded Esso. The pub building was heavily modified in 1987 to become the Ingleby Arncliffe branch of Little Chef. This closed in around 2005, and was demolished a few years later, leaving behind a square patch of grass in the middle of the parking areas with little evidence of what used to be there, other than a few Little Chef-style lampposts. The southbound branch opened around the same time, called Trenholme. The Trenholme Little Chef closed in around 2005. It went on to become CJK's Restaurant, Polly's Diner and Jan's Cafe and Takeaway.